Jealous of the Multi-Touch trackpads on the latest MacBooks? You can have something better! The red fabric tag isn't just a whimsical flourish; it holds your stylus when not in use! Usually, product names are either a dull series of numbers or some unfortunate, aspirational nonsense dreamed up in a latte-and-biscotti fuelled boardroom; this second generation Bamboo Fun, though, is just that – great fun. On first inspection, this is just more of the same from Wacom; it's a small graphics tablet with a stylus that you can use both as a tool to draw and write on-screen, and as an alternative to a mouse for general interface tasks. 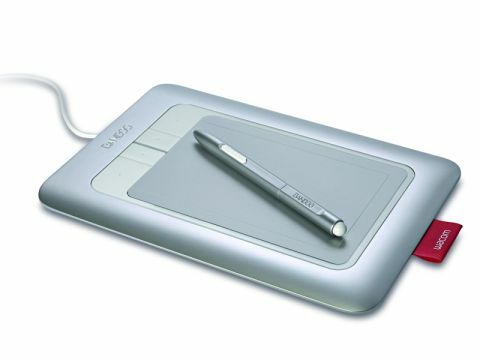 There are four configurable buttons to the left of the active area, as well as the traditional two-button rocker and eraser tip on the stylus. This tablet has an extra trick up its sleeve, though: you can use your fingers as well as the stylus, so it's like a giant laptop trackpad. You can't use both at once – as a warning, the white status light turns orange when the stylus tip is near the surface – but happily, we were able to use our fingers on the tablet surface with the stylus resting in our hand, just as you would instinctively. In this touch mode, you don't get any pressure sensitivity; it's just about moving the cursor about on the screen and selecting stuff, as you would with a mouse or trackpad. It is, though, smarter than that: it supports a range of basic gestures, so that you can scroll and pan on pages by using two fingers. A two-finger tap does a right-click, a two-finger swipe left or right sends a back/forward command, and you can, at least in some applications, do the pinch/unpinch gesture familiar to iPhone users to zoom in and out. The decision to position the cable on the left edge seems a little awkward, and even this small model is quite expensive, but overall this is a great, fun package.